Falling Down, Blush, and Amplify are available now as audiobooks!! IT’S EARLY AND IT’S LIVE… My belated Valentine’s day pressie to you all. Enjoy! It’ll be $1.99 until MARCH 1… then the price will be $2.99. Book Blitz, Release Day Blitz, and Blog Tour Signup Links!! The book blitz and blog tours are for Authors and Bloggers, please sign up for these events through the below links. Thank you so much for your continued love and support of the Rockstar series! 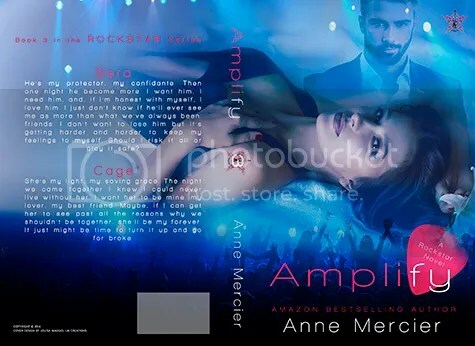 Amplify, Rockstar #3 – coming Feb 22… 13 DAYS! We walk into the kitchen just as the tea kettle begins to whistle. Then I was able to focus and do what needed to be done. Just get through life until I could find my parents’ killers. I haven’t forgotten and as much as my parents tell me I should let it go while I dream, I can’t. Someone took them from me, took their lives so senselessly, so brutally, and then walked away without a thought. I grind my teeth and watch as a bird lands on the sand, picking at a dead fish. Irony, or my parents with a message? “Here we go,” Cage says and sets a tray next to me. He takes a seat on the other side of the window seat, crossing his legs like me and I grin. He’s huge… get your mind out of the gutter. I mean overall, not his naughty bits, but in truth that’s nicely proportioned. When he grins, I feel the blush staining my cheeks. “It doesn’t matter what I think or know,” he replies, leaning forward running a fingertip over my flushed cheek. Here it is… the cover for Amplify–which is coming out FEBRUARY 22ND!! !